The first Biturbo was introduced in December 1981, a complete, contemporary difference from the existing V8 Maserati sports cars. The all-new V6 engine was only two liters in size (two-and-half for export cars) but its twin turbochargers increased its power up to 180 bhp. The car wasn't cheap but sales figures for the Biturbo in 1983 rose to 6000 which apparently became Maserati's best sales year ever... The Biturbo was also exported to the US. During the years after 1981, this two-door coup� model, originally "invented" by Alejandro De Tomaso, saw a lot of variations such as four-door saloons, bigger engines up to 2.8 liters, and even a Spider version. 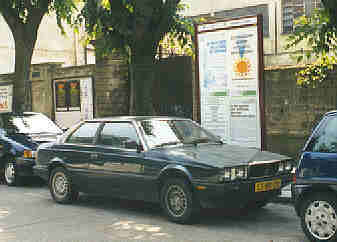 In about 1991, the range was succeeded by the two-door Ghibli, which was stopped in 1997. From Biturbo, via the Ghibli and now in the 3200GT there is at least one common factor: the two small turbochargers, which give these cars this unbelievable "instant speed" characteristic. 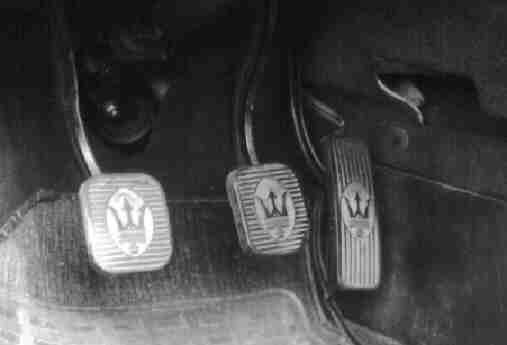 Autovisie tested a Ghibli once and described its handling in traffic as speedy as "a rat in the sewers". Based in the Netherlands, I bought one in August 1996 after a search that took a few months. I was heading for an early example to have the "purest" Bi. And found one - a 2 liter engine, manual gearbox, no power steering, 75000 kms. Imported from Italy two years before. 30 months later, in March 1999, I sold the car, showing 106000 km. During my ownership, it never left me along side the road. Well, almost never... read the Dark Side!